"God did not call me to be a rock star. He called me to express my salvation through music. And there is a vast difference. He made it very clear to me from the start that if I intended to follow Him, I should never expect more than having to drive 8 hours to play for 10 people who don't know who I am and who don't care. They might not buy the CD, and I might have to sleep in my car that night, before I get up and do it all over again the next day. It was very clear that this was not going to be about me. So I'm trying hard to remember that. I fail miserably at it most of the time." "Sometimes, when I start to think I'm really cool, God allows me to trip and fall flat on my face, so that I'm eye-level with those feet that need washing. It's humbling. I honestly had to look back at that whole day and say, "Thank You, God, for answering my prayer and for reminding me that it's not about me. I keep forgetting." Tara Leigh strives to follow wherever the Lord leads her in her music ministry for Him, a ministry that He has been preparing her throughout her life. Her first album, BENEATH THIS SKIN was released in 2000, a collection of songs described as being compositions "that seem to penetrate the heart." Tara's second album, HOME SWEET ROAD was released in 2002, proclaimed by Performing Songwriter Magazine to be a collection of songs which "reverberates with energy and life." Her third album, THINGS YOU CAN'T STOP WITH YOUR HANDS was released in 2004, a truly inspiring collection of songs which I as a reviewer I'm excited to explore and review for you. Tara Leigh grew up in a large family on her family's farmland in Greenville, Tennessee, traditionally a rural community, in a very pretty part of the state. Her grandfather settled the land and built the family home. Her parents built a house across a field from her grandfather's house. While her family didn't own the field that was between their houses, the owner of the field let them cross it to visit with the other family members. The Lord put people in Tara Leigh's life to plant seeds of faith and develop the gifts the Lord blessed her with. The Lord further molded and shaped her through various experiences; both the good times and the trying times. Tara Leigh has become and is in the process of becoming; a servant of Christ through her music ministry. "I grew up in a Christian home, the youngest of 6 kids. My family was very musical. Everyone sings and plays a variety of instruments, everything from the flute to the banjo. I took piano and flute lessons as a child, and I started singing at church sometime around age 5. My early love for music prompted me to start writing fairly early on, as well. I wrote my first song at age 6. It was a duet with my friend Sara. Since then I've written probably 300 songs, but they never felt right until I started playing guitar in college. When that happened, the guitar immediately became my favored instrument for the song writing"
"My earliest memory is of my mother teaching me John 3:16. My second memory is of my brother Jason leading me to Christ when I was probably only 4 years old. God pursued me over the years, and my relationship with Christ was strengthened mostly through my family and my youth group." "My parents were amazing examples of godliness to me. I saw them living what they believed, and I saw that it was consistent in their lives. My dad was instrumental in teaching all us kids apologetics, helping us to understand why we believe what we believe." "As a result, I never had that question, 'Does God exist? Is this stuff really true?' The only thing I had to grapple with was my response to that. Instead of asking, 'Does Jesus really love me?' I was asking, 'Am I going to love Him Back?' And I am so incredibly grateful that His love has seized me." In 2001, Tara Leigh Cobble was a culinary student, working in a job she didn't like, while songwriting and performing on the side, being prepared in a variety of ways to go to the next step in the Lord's plan for her life. Even her distasteful job in the long run prepared her for her musical career. During 2001, Tara Leigh was called into music ministry full time and became a full time musician for the Lord and his Gospel, showing people His love through her music and her personal connections she makes with her audience, which range from small groups to large ones, ministering to whomever the Lord puts in her path along the way. It is always interesting how the Lord puts people in our lives to help us in whatever calling He has in mind for our energies. The Lord put people in Tara Leigh's path who have helped her launch her music ministry, contributing through their friendship, mentorship and considerable musical gifts, and other talents needed to create collections of songs for albums. ChristianMusic.com asked Tara Leigh to share about the various people she has met which have helped her to evolve as a Christian music artist, and have contributed musically to the sound on HOME SWEET ROAD and THINGS YOU CAN'T STOP WITH YOUR HANDS. Todd Bragg and Garett Buell - In 1997, Tara Leigh met most of the members of Caedmon's Call and she got to know Todd Bragg fairly well after that. Then, 4 years later in 2001, when Tara Leigh was on tour in Atlanta, Tara Leigh shares with ChristianMusic.com, "I ran into Caedmon's and Bebo Norman while I was in town. That's when I asked Todd about playing drums on my second album, HOME SWEET ROAD. Todd graciously obliged, and we all had a blast recording that album." Concerning her third album, THINGS YOU CAN'T STOP WITH YOUR HANDS, Tara Leigh again asked Todd Bragg to help, and his fellow band member, Garett Buell as well. Tara Leigh shares with ChristianMusic.com, "Since Garett and Todd are so complementary to each other's rhythm skills, I called Garett and asked him if he would be willing to lend a hand on this album too. They are both so gifted, and it was such a blessing to have them along for the ride." Jett Butler (Contribute guitar work for Tara Leigh's 3rd album) - Tara Leigh shares, "I met Jett Butler while he was on tour with Bebo Norman during the "Big Blue Sky" tour. Donnie Boutwell played drums on that tour, so they were already friends. Jett is such an inventive guitarist, and that's what we were looking for on this album, so Donnie suggested that we give him a call. It was the best possible decision. It not only made THINGS YOU CAN'T STOP WITH YOUR HANDS better, but it increased my faith in Donnie's decisions as producer, as well." Matt Wertz - A good friend of Tara Leigh's who sang background vocals on HOME SWEET HOME, and introduced her to guitarist and vocalist, Steve Wilson at Wilson's studio in 2002. Steve Wilson - Contributed guitar work and background vocals on THINGS YOU CAN'T STOP WITH YOUR HANDS. Tara Leigh comments, "I love what he added!" Andy Davis (Vocalist and Songwriter) - Contributed background vocals / guest vocals on THINGS YOU CAN'T STOP WITH YOUR HANDS. Tara Leigh comments, "He just has an amazing gift for singing and songwriting! I was so happy when he said he'd lay down some vocals for the album! He has my favorite voice on the planet." Kemper Crab (Former Caedmon's Call member)- A mentor who is a source of encouragement and direction for Tara Leigh, who met Kemper through Todd Bragg several years ago. Donnie Boutwell, (Producer of her new third album) - Tara Leigh was first introduced to this talented music producer, who has produced albums for such groups as Caedmon's Call, Bebo Norman, David Crowder, and up and coming acoustic indies, at Matt Wertz's birthday party, a fellow Christian artist friend. Tara Leigh shares with ChristianMusic.com, "I met Donnie at Matt Wertz's birthday party, shortly before I moved to Nashville. I found out that he had produced some albums for some of my other friends and artists I admire, so we had a lot to talk about. I was really impressed with his ability to produce a variety of genres; he's a really diverse producer, and he works hard to enhance each artist's sound." Trey Bowles (Tara Leigh's manager - Exec. Prod. of 3rd album) - Tara Leigh shares, "My manager, Trey Bowles added so much to the recording process. He ultimately served as Executive Producer for the album, and I can't over-emphasize how much his direction helped." 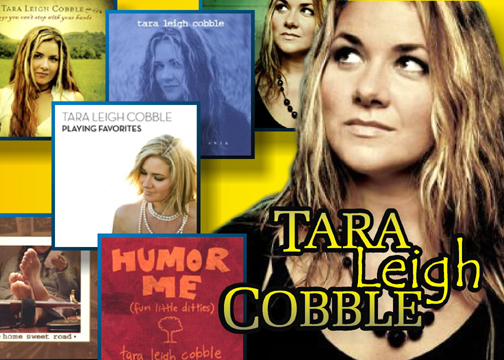 Tara Leigh shares with ChristianMusic.com how she writes her music. "I write mostly with my guitar, but occasionally from the piano. Often the lyrics and the melody come at the same time, and then I build the chord structure around that framework. Probably 90% of my songs are written that way." 10% of her songs come about in other ways, sometimes by "happy accidents." Interestingly, the song "Here's To Hindsight", musically got its start from a guitarist playing around with a guitar rift in his recording booth while waiting to record another song, "Beautiful Drive", for the THINGS YOU CAN'T STOP WITH YOUR HANDS album.